Species : gigantea R. Br. ex Ait. Preparation : Fresh leaves are heated over a naked flame for abdominal pain treatment. Young floral buds, crushed for application in cases of earache. Stem cut for latex. Root is crushed with milk for deccoction. 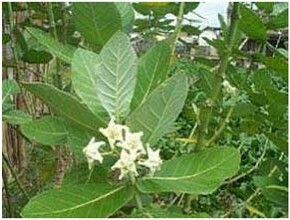 Ingredients : Extract of aerial part of the plant possess potent analgesic effects indicating the possibility of developing the plant as the cheaper, safer and potent analgesic therapeutic agent. 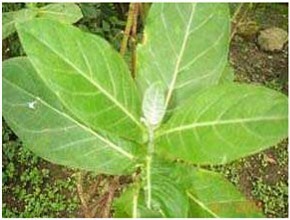 Ailment Treated : Root, used as a poultice in ulcers and other skin diseases. Young floral buds juice used for earache. Root is useful in leucoderma and leprosy. Latex is applied on ringworms. Root-bark is used in dysentery. Flowers are given in cold, cough, asthma and indigestion. Fresh root is boiled with cattle milk and the soup is taken against dog-bite.